This is an odd tutorial because it is just the instructions for a kit that I made for my mother. Hopefully it will make sense!? The bag measures 16.5" x 14". 15" of twill tape (or ribbon) cut into 3 pieces. 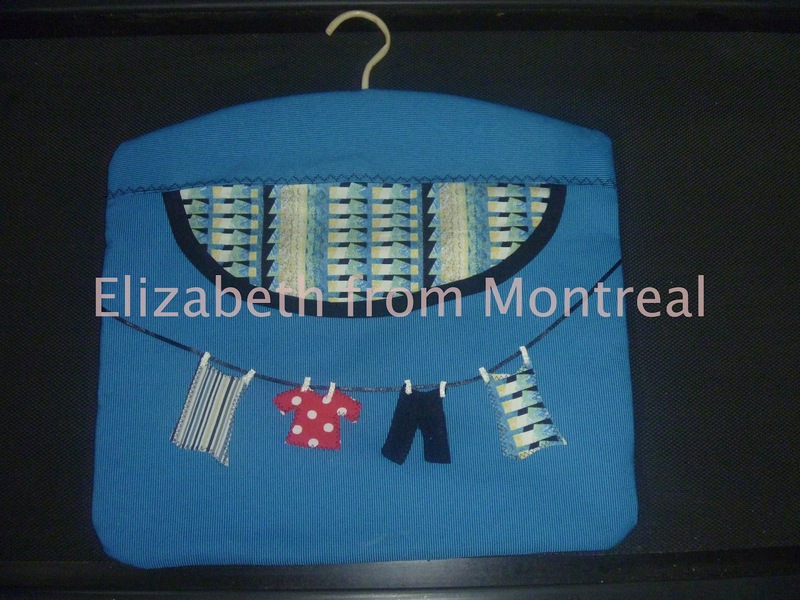 The bag is made up of three pieces. The back is 16"high and 17.5" wide (the width of the hanger plus 1 "), the bottom front is 13" x 17.5" with a 5" deep curve cut out at the top leaving 2" 's on each side. Both are lined with iron-on lightweight interfacing, have a layer of diaper flannel and a lining piece of coordinating fabric. The top front section is 8" x 17.5". Half of it is lined with interfacing and flannel and it is then folded in half. The top of the bag (both front and back) is cut in the same curve as the hanger. After embellishing, quilting and edging the bottom front curve with the bias, the two front sections are sewn together (the top section overlapping the bottom section and decoratively stitched). The front and back are sewn together (1/2" seam allowance, right sides together), with the 3 pieces of twill tape (folded in half) evenly spaced along the top (don't place the twill tape between the two layers, just lay them on the top), and a small opening left open at the top for the hanger hook. A 3" base is made by sewing across the bottoms corners of the bag. I also zig-zaged the seams to finish them. Turn the bag right side out, insert the hanger and secure in place with the twill tape. Done! I get a lot of questions about where the twill tape/ribbon goes. The three pieces are attached when sewing the upper seam, spaced evenly - two from the ends and one next to the hole in the centre. They then just tie around the hanger inside the bag. Hopefully this photo of the inside of the bag helps. Jessi (Joy Unspeakable) stitched this great bag all by hand! 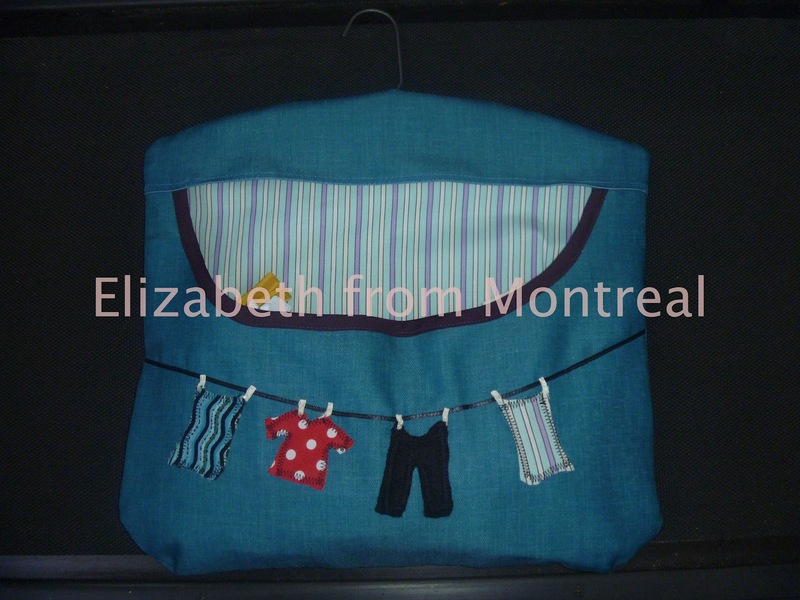 Elizabeth (no blog) used outdoor fabric instead of quilting fabric to make these lovely bags - such a great idea! If you have made the bag, and would like to see a picture here, please send me a picture to add (my email found here). Thanks! I love seeing your creations. do you suppose she'll surprize me with one made from your tutorial? Thanks for taking the time to write up the directions. Thanks so much for posting this tutorial! 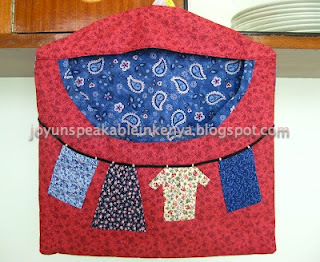 I am in love with this clothes pin bag and plan to make one for each of my sisters too. Thank you for the wonderful site, I made a clothes pin bag somewhat similar years ago out of denim. Worked very nicely, wore well. where do you get the patterns for your beautiful q uilts? Bellissimo, grazie mille!!!! Meraviglioso anche come idea-regalo! Awesome! Just what I have been looking for - simple, yet very nice! Will be making one very soon! Thanks for the tutorial! Just finished one as a gift for new daughter in law - they just bought a house and have clotheslines and plan to use them. I used blue denim white red print lining. Also embroidered clothesline design on the front.